A kitchen renovation is one of the most complex tasks you’ll undertake and how much? is often the first question that springs to mind when your thinking of taking that next step. As per our previous article “Things you should consider before undertaking a kitchen renovation” establishing a budget is one of the first things to consider as part of the planning process. It is important to set a budget from the outset so that your design, layout, finishes & fittings all fit within your pre-determined budget. The price of any kitchen can vary depending on the size of you room, your choice of cabinetry, fixtures, fittings and appliances. In this month’s Balnei & Colina Journal we’ll explore the cost of renovating a kitchen and help define fixed and variable costs within the project to help guide you in establishing a realistic budget for your next kitchen renovation. We hope it provides you with some insight into the cost of renovating a kitchen. While some work within the home maybe appropriate for a DIY project a kitchen renovation certainly is not given the dollar investment involved. Each kitchen renovation provides an opportunity to enhance not only the aesthetic of the room but also the function. Consult a professional kitchen renovator and designer like the team at Balnei & Colina to ensure your getting the most value for your project. A kitchen expert can provide sound planning advice from design through to construction and ensure that the renovation runs smoothly on time and within budget. A complete kitchen renovation is a large commitment for any homeowner and requires careful planning and a basic understanding of the costs involved. Materials, fittings and appliances will make up a large portion of your budget however trades including installation, electrical & plumbing will also carve out a large chunk of your budget. It’s also important to understand that no kitchen renovation is the same. The location of your kitchen, size and the condition of your property are all factors that influence the price of your kitchen renovation. Appliances can have a great impact on the final price of your kitchen for eg a Westinghouse appliance package might set you back $5K but a Miele package will cost you upwards of $10K. Determine whether you need new appliances, review your cooking routine (ie how often you cook and which of your appliances get used the most). Ask yourself how important the cooking result is for you. If you don’t spend a lot of time in the kitchen and prefer to eat out most days perhaps investing less in large appliances and more in other areas of your kitchen is a better option. A kitchen enthusiast however may warrant investing in appliances that produce the finest cooking results. Items such as benchtops are another area where you can influence the final cost of your kitchen. A laminate benchtop may cost as little as $1-$2K however a premium stone will cost upwards of $5-$10K. Your choice will affect the final cost of your kitchen renovation. Items like handles, lighting and decor can also add to the cost of your kitchen and are another variable cost you can influence. Changing your kitchen layout can also effect the final price of your kitchen renovation. If your new layout involves relocating plumbing or electrical this can add to the cost. Minisiming layout changes or opting for the same kitchen layout will reduce the cost of renovating and is another price factor you can control. At Balnei & Colina, for the cabinetry component of our kitchens, a good starting point for our kitchen renovations in Sydney are $15-$20K and upwards from there for a large scale luxury kitchen depending on the size of the kitchen, it’s design and layout. Your benchtop, appliances, finishes, fittings and trades will need to be added to this cost. 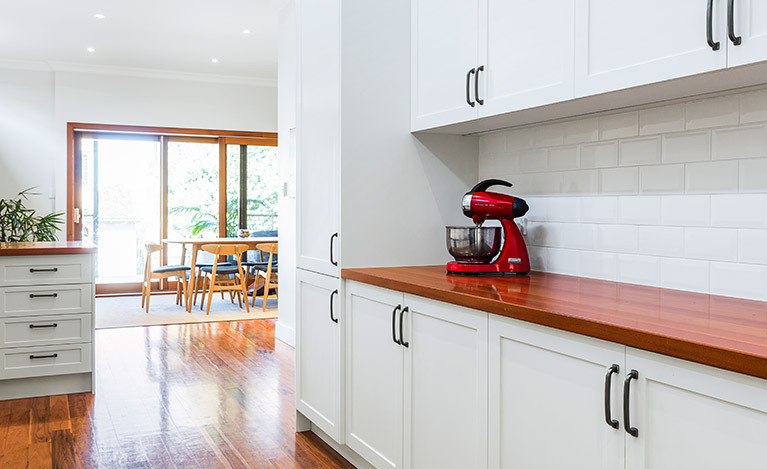 Average prices for kitchen renovation trades in Sydney vary but at Balnei & Colina we suggest clients allow for between $4-$5K for trades including removal & disposal, plumbing, electrical and tiling. At Balnei & Colina we price for value so there is no comprimising on quality for any of our kitchen renovations. The high standard of craftsmanship and design remains. These are what we define as non-variable or fixed costs and will ensure your kitchen renovation will remain functional, durable, and beautiful for years to come. It is important to also think about hidden expenses that may not be on your radar. The footprint of your new kitchen may not line up with your existing flooring therefore new flooring maybe something you need to consider and allow for. Often when renovating kitchens, particularly in older style homes where traditional home layouts need to be adapted to fit in with today’s modern living, we often need to remove walls. This will in turn impact both the floor and ceiling and will add to the overall cost of your kitchen renovation. A kitchen renovation may seem daunting but with the right planning the outcome can truly change the way you live and add substantial value to your home. Improving not only your home value, but your lifestyle as well. Want to renovate your kitchen but still unsure where to start? 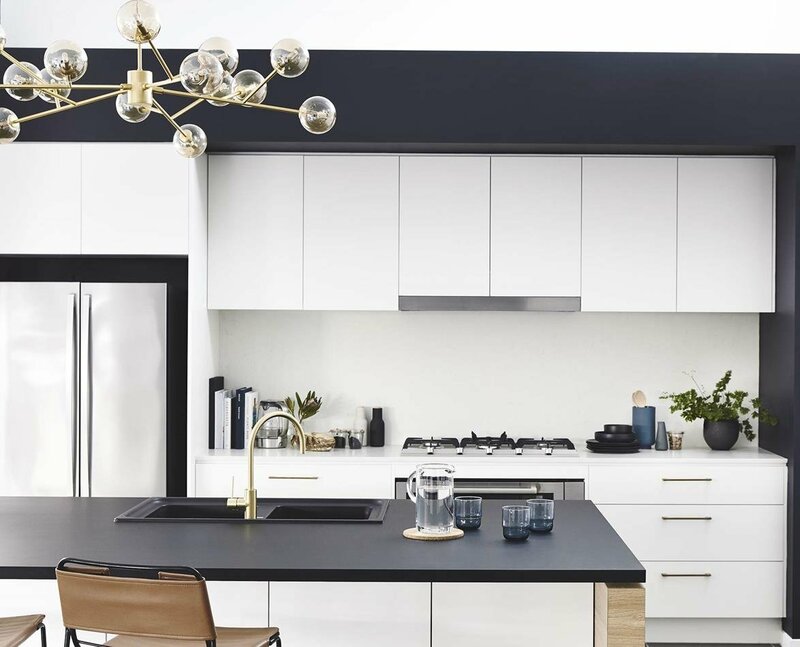 Book a design consultation with a Balnei & Colina kitchen renovation expert today on 1300 450 320, drop us an email info@balneiandcolina.com.au, visit us at balneiandcolina.com.au or connect with us via Facebook or Instagram to stay up to date with the latest kitchen and design trends.